Famous last words and all that but today was anything but sunny. Still at least it was dry, in the main, meaning that a canoeing trip to Calgary seemed just the ticket. Unfortunately for us we are without a proper roof rack at present and the easy fit foam substitute we’d purchased was far from up to task. Slightly dejected we packed everything away and sat down to reconsider our options, only to spot an eagle heading directly for us across the valley. Obviously we assumed it to be one of our Goldies but as the distance closed its build started to look all wrong. 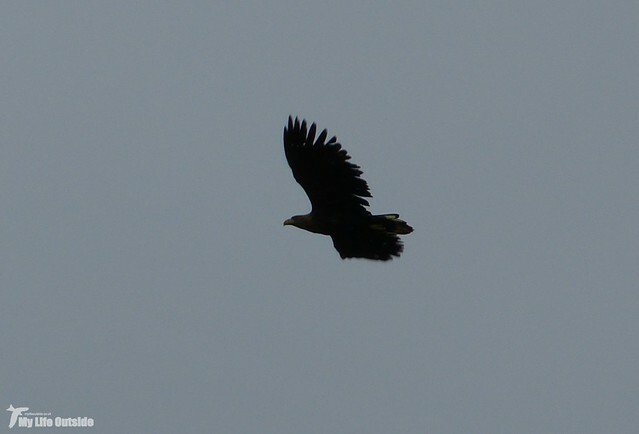 A photo snapped as it passed directly overhead confirmed our suspicions that it was in fact a White-tailed Eagle! 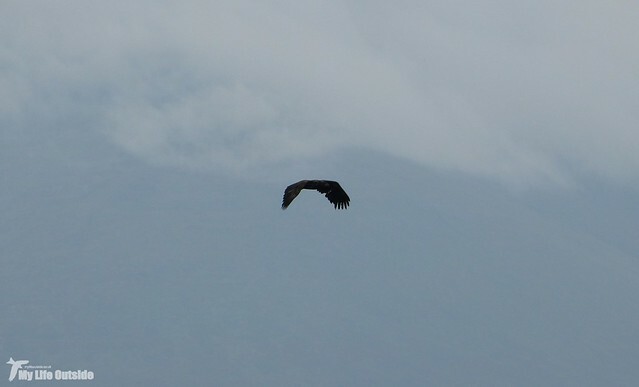 I’ve never seen one in our valley before and with a pair of Golden Eagles sat down on the cliffs that made for two separate eagle species visible at the same time. Where else can you get that from your front door? With that the plan for the rest of the day was pretty much made for us so we headed off down the valley. Almost immediately we spotted the White-tailed Eagle again, this time passing from right to left between two headlands before putting the frights up a group of roosting Shags. Creeping closer the hope was that it had landed somewhere on the wave cut platform below but clearly our approach had not been as stealthy as it could have been. Even before we’d popped our heads over the cliff edge it was up into the air though we never could have anticipated the way in which it turned back and practically hovered directly overhead. Though the lighting was terrible they were the best ever views I’ve had of a bird that even here can make a Goldie look small. 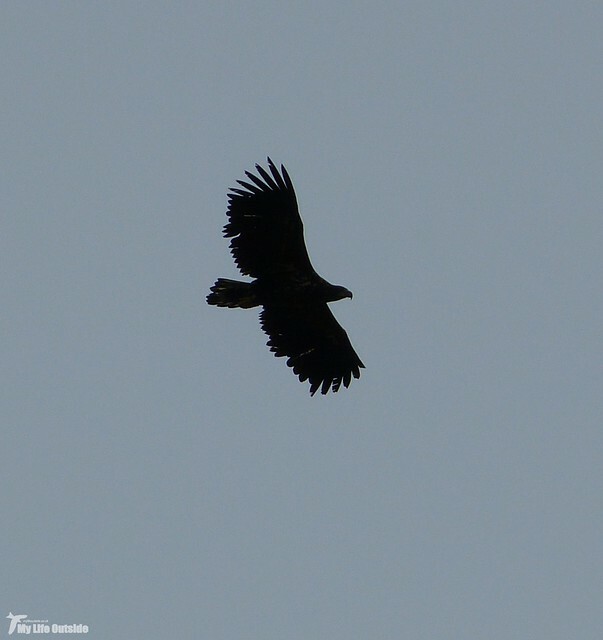 Speaking of which we had started to wonder how this intrusion into the Golden Eagles territory would be tolerated, especially when one of the adult birds turned up high off to our left. Slowly but surely it approached the intruder until finally, on swept back wings, it moved in for the challenge. Perhaps unsurprisingly for such large birds the coming together seemed rather amicable with a couple of talon grabs as frisky as things got before both moved off in their separate directions. It was clear though that the White-tailed Eagle still had intentions on this territory as it stayed in the area for a good long while before finally heading off back towards Loch na Keal. As if to mark this departure all three Golden Eagles appeared once more and stayed in the vicinity until the weather finally turned. Throughout all of this I’d been keeping my eyes open for the Otters seen yesterday and was finally rewarded when both swam into the bay. They clambered out onto a rocky island and spent the next twenty minutes engaged in what to me at least looked like play. Although far from certain we think that this may be another mother and cub but will hopefully get better views across the coming days. 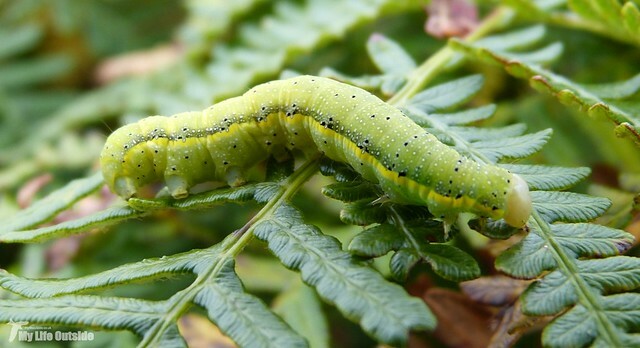 As usual there was plenty more on offer other than the big ticket items including the caterpillar above. As far as I can tell this is a Bright-line Brown-eye moth caterpillar, a new species for me. And that was pretty much the last we saw, not only in terms of wildlife but also the surrounding landscape. Not long after returning home the fog and rain rolled in obscuring all but the closest features. Maybe it isn’t sunny here every day after all……..
A great day. It is good to get sharp clear images but just as satisfying to sit and watch.